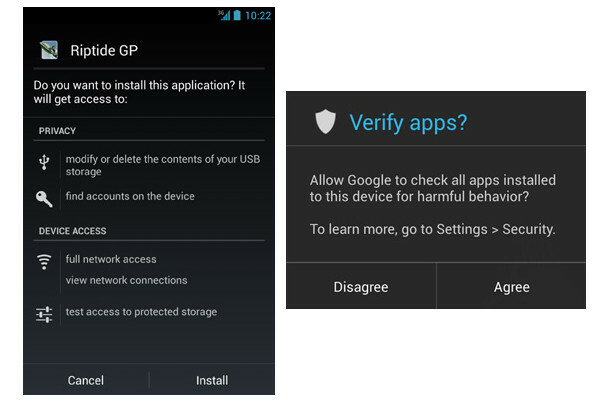 Once your phone receives an update to Android 4.2, know that Google has your back when it comes to security. According to a report out of ComputerWorld, Google baked a new security app scanner into 4.2, because many of you continue to install apps that aren’t from the Google Play store. All of those sideloaded apps that we post or that you find in shady dark alleys of the internet, will be scanned remotely on Google servers almost instantaneously. If the app is clean, you’ll proceed. If the app gets flagged, your phone will then warn you and let you decide if you want to proceed. This new app scanning service is optional and must be activated or it won’t run. Also included in the new security suite of services for Android 4.2, is a system that will warn you if a text messaging service is trying to send out messages that could cost you money. If your phone discovers one of these, it will stop the service and then let you decide if you want to allow the action to happen or not. Last, the app permissions page that pops up during app installs has been refined. As you can see in the screenshots on the left, it’s much easier to read.